By the end of the Greenbelt this summer, festival-goers had sponsored 215 Olive Trees, keeping hope alive for Palestinian farmers and their families. We couldn’t believe it – even with the award-winning focus on Palestine-Israel, we were overwhelmed by the generosity shown and the renewed interest in this most important of issues. Children with disabilities are still one of the most marginalised groups in the occupied Palestinian territories. They are isolated from other children of the same age and, with the occupation limiting their access to healthcare, it is difficult for them to get treatment and rehabilitation, let alone reach their full potential. Lack of accessible classrooms and equipment, such as wheelchairs, means it can be impossible to get an education, and because of social stigma, even in 2017, parents keep their disabled children out of sight. The Princess Basma Centre for Children with Disabilities in occupied East Jerusalem has a long and inspiring history of championing equality. Founded in the 1960s, it is now a world-class rehabilitation centre offering physiotherapy, recreational therapy, speech and language therapy and hydrotherapy, as well as supporting each child’s whole family through counselling, education and strategies for challenging prejudice. 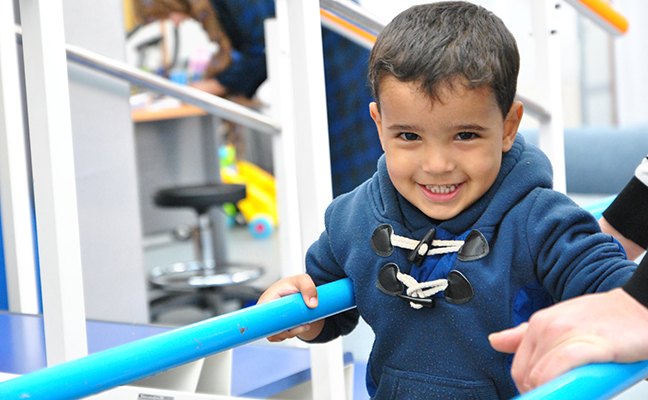 …Two and a half-year-old Marwan breaks into a smile as he makes his way along a wooden ladder in the physiotherapy room at the Princess Basma Centre in occupied East Jerusalem. His mum, Nahla, is there to cheer him on as the therapist encourages him to take small but decisive steps towards a toy, designed to help him develop co-ordination skills. When he reaches the end of the ladder, he grins proudly as he slots coloured buttons into the toy. Marwan, who has cerebral palsy, would not have received any professional help at all but thanks to the Princess Basma Centre who have established a new outreach programme called Living Roots. The project extends into the heart of disadvantaged and isolated communities to support disabled children whose families cannot otherwise afford the services they need or access the healthcare that is available. Because of the travel restrictions imposed on Palestinians, the Living Roots team go out to smaller health centres across the territory to teach people about the wellbeing and rights of children with disabilities. And children like Marwan, who need specialist therapy, are referred back to the centre and given help to travel there; the team even help families apply for permits, and provide specialist transportation. Marwan will be at the Princess Basma Centre for a week’s stay as he undergoes various therapies. The centre also operates a ‘Mother Empowerment Programme’, which means Nahla can also travel and stay with her son, join in all his therapy sessions and learn how to continue supporting him at home. She has individual and group counselling, receives accurate information about her child’s condition and spends time with other mums in the same situation, building a network of friends who will support each other in the future. Without the Living Roots team going into Nahla’s village, and helping her get to the centre, she would not have known there was help for Marwan. Embrace and our supporters believe in getting into the heart of a community to break down the barriers that prevent children with disabilities getting the right support at the right time, and to challenge the social stigma that still surrounds those children.